From my colleague Anna Chen. The plans are to install the deodorizers in every rail car — four per car. The deodorizers have charcoal granules in them that are designed to absorb odors and have a very, very slight lavender vanilla scent. 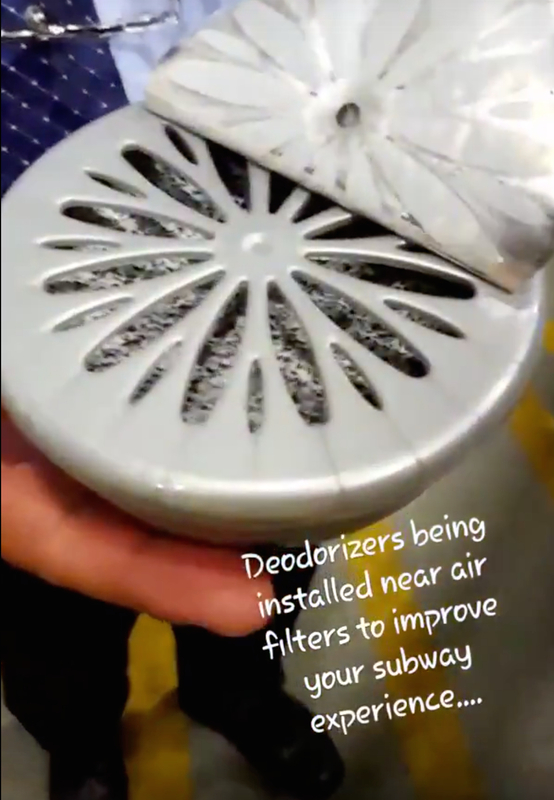 The deodorizers will initially be installed on the Red/Purple Lines. We’re guessing that many people may not even notice, but perhaps some will. Feel free to let us know what you think on our main Twitter feed. Manila Luzon spent a day on the system yesterday to film promotions for RuPaul’s DragCon, which takes place April 29-30 at the L.A. Convention Center. That’s only steps away from Pico Station, shared by the Blue Line and Expo Line. Photo by Steve Hymon/Metro. Kind of interesting from Los Angeles Mayor Eric Garcetti’s State of the City speech this morning. The Board currently has committees that cover planning, finance and budget, safety and operations, construction and executive management. Garcetti says he'll allot ~$17M next fiscal year for Vision Zero, the program aimed at eliminating traffic deaths on city streets by 2025. At SeaTac airport, they just had a PA announcement for whoever "left the ashes of Anthony" so-and-so at a restaurant. Please pick them up. 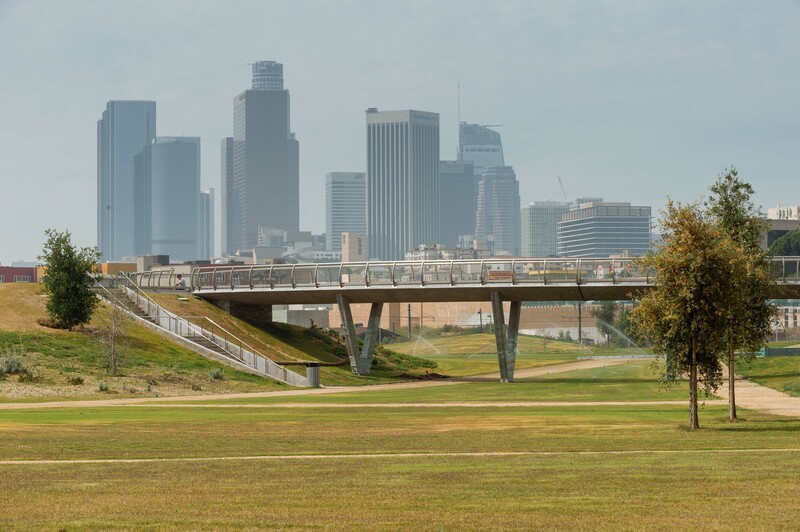 DTLA’s newest park is easily accessible from the Gold Line’s Chinatown Station. The park opens April 22, 2017. Photo by Steve Hymon/Metro. Nice piece about the history of the 32 acres of land adjacent to the Gold Line’s Chinatown Station (despite the misleading headline, the park was open for a long time before being closed for its makeover). I think it’s also fair to point out that bike lanes in DTLA (and many other parts of our region) are still very much a work-in-progress. The more places to ride, the more people will probably want to ride. A Twitter conversation also followed with some interestingness. The argument for this new political party: cities are where things actually get done these days with less partisan rancor that seems to infest the country’s statehouses or Congress. The park would be on both the east and west of the new structure. Pretty cool and some nice open space for the Arts/Industrial Districts and Boyle Heights. City of L.A. presentation with renderings. In this video, the Big Cheese at Citrix says a lot more people will be a lot less tied to their desks. Working remotely isn’t quite the same as working at home (take that, rush hour traffic! ), but here are some Census numbers on that front, although they’re getting a little long in the tooth. Which route should the West Santa Ana Branch project take into DTLA? Spoken by someone with a product to sell. I have been hearing this spiel forever, I guess the executives haven’t heard that micro size apartments with noisy roommates isn’t the best work environment. Team building by email is frought with danger and potential misunderstanding – no facial or voice expression. Not going into the increased IT related security risks. hooray for smelling good. a little detail that makes a better ride experience.